Things around the house could save you a trip to the vet if your pet is having any of these issues. If you've got a gassy, nauseous, or itchy pet, your cupboard and refrigerator might have the answer to offering your pet some comfort. Numerous home remedies exist to have your pet back to tip-top shape. Note that it is important to get to the root of the problem, so if the symptoms persist, there may be a more serious, chronic underlying problem that needs to be treated. In this case, visiting the veterinarian is the way to go. We've all blamed the dog for the smell in the room, but sometimes it really is Spot who has the gas. Giving fennel to your pet can decrease the farts, easy peasy. Just sprinkle some of the powdered spice on your dog or cat's food, adding some water to make it stick if your pet eats dry kibble. If the flatulence exists for more than a week, then your pet may have more serious GI issues that need fixing. It could be a parasite that should be treated with antibiotics, or your pet could have a food sensitivity. The wonders of pumpkin were mentioned in our last home remedies article, but yogurt, too, can put a stop to the runs. As "living cultures," yogurt is packed with probiotics--the good GI flora that counters the bad bacteria. Veterinarians will often prescribe a probiotic supplement for a dog with the runs, such as Fortiflora. If diarrhea persists, make an appointment with the vet to develop a more in-depth treatment plan for your pet. Note that prolonged diarrhea can result in dehydration. Vertigo and vomiting can be treated with ginger and mint in dried or candied form. You may have even heard of this home remedy for seasickness or altitude sickness as drinking herbal tea can curtail vomiting episodes. Vomiting can also be a sign of foreign body ingestion or organ failure. If your pet is vomiting profusely in a 24-hour time span, skip the home remedy and go to the ER. Dehydration can also result from excessive vomiting. Remember taking oatmeal baths as a kid with chicken pox? Oatmeal baths can help soothe itchy skin in pets, too. Adding dry, powdered oatmeal to the irritated region can also ease the itchiness. However, itchy skin almost always has an underlying concern that needs to be addressed, such as fleas or allergies. It your pet is itching violently, oatmeal can help soothe their skin, but they should still be treated for the medical cause of their condition in the meantime. Another good antidote for a nauseous pet is oat grass. Dried seeds work well, but growing your own oat grass is even better. Dogs and cats are known to munch on grass when they have an upset stomach. If they have oat grass available to chow down on, they could be feeling better much quicker! 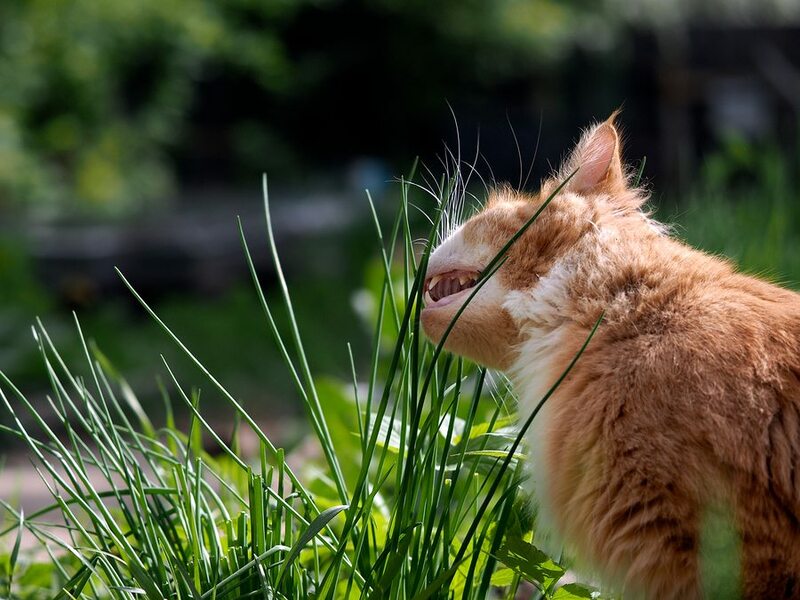 Cats especially love oat grass. Home remedies are a budget-friendly alternative to expensive pharmaceuticals. However, they are not always the only option one should take to treating a pet's ailment. A holistic veterinarian might offer more natural alternatives to fixing a problem, but sometimes laboratory tests are still necessary to determine the factors causing the bodily upset so that that condition, not just the symptoms, can be treated. Additionally, Western medicine might still be employed by a holistic veterinarian when warranted. Be sure to differentiate between cases that can be managed with at-home care and situations that require a doctor visit. We know you want what's best for your pet and will do whatever you can to make them feel like themselves again!